RummyCircle, the premium online rummy portal from India has launched a new rummy bonus offer. The offer is applicable to all the club members of RummyCircle on their first successful deposit with the promo code. The maximum bonus the players can avail during the offer period is 15% up to Rs.1500. The bonus amount a player can avail may vary depending on the club he is in and the amount he deposits. The rummy bonus offer will go live on Friday. So, mark the dates and be ready to make your deposit to gain extra cash as bonus. 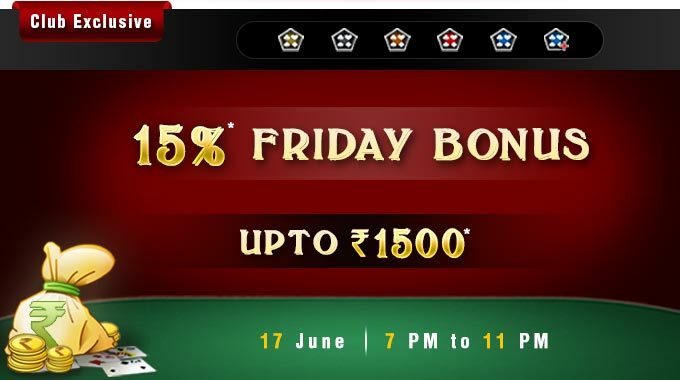 The Friday Rummy Bonus will run on 17th June 2016 from 7:00 PM to 11:00 PM. The bonus offer is only valid for club members at RummyCircle on their single successful deposit with the promo code. The maximum bonus you can avail as a Platinum Elite club member during the offer period is 15% up to Rs.1500. To know more about the website, read our review on RummyCircle. If you have any query on this rummy bonus offer, feel free to ask us by dropping your comment in the section below. Furthermore, don’t forget to follow our blog by clicking on the subscribe button.